Sophomore Adam Petro crushed the Wabash school records in the 200 backstroke and 200 butterfly on his way to two top-12 finishes. His ninth-place finish in the 200 back and 12th in the 200 fly at the 2008 NCAA Division III Men's Swimming and Diving Championship meet earn him Honorable Mention All-America honors for the second consecutive season. Petro started the day with the 200 backstroke in the morning preliminary session. He finished ninth with a time of 1:51.74, missing the championship finals by just 3/10ths of a second. His time smashed his own school record in the 200 back, eclipsing his previous mark of 1:53.45 set earlier this year at the TYR/CollegeSwimming.com Invitational at Carthage. Thirty minutes later he hit the starting blocks for the 200 fly, finishing in a tie for 11th place with another Wabash record. He touched in 1:50.97, well ahead of his record time of 1:52.18 set a few weeks ago at the Kenyon Last Chance meet. 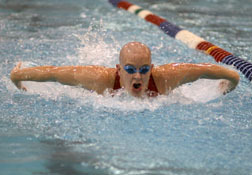 "Adam's back stroke finish was much better than we had ever hoped for," head coach John Weitz said after the prelims. "We really didn't expect him to swimming the back tonight, but it just goes to show what kind of a competitor Petro is. He's truly a Wabash man." Despite the energy expended in the morning session, Petro (left) showed he still had plenty left in the tank. The sophomore nearly matched his prelim time in the 200 back consolation finals, finishing in a tie for ninth with a time of 1:51.76 --- 2/100ths of second away from his morning mark. Petro hit the pool for the last time and still found a way to be fast. One last 200-yard swim --- this time the butterfly --- and once again he posted a time that would have broken the school record if not for his morning time with a 12th place finish at 1:51.55. "It was an incredible performance," assistant coach Kyle Dunaway said. "Adam was swimming two events in a championship meet against guys swimming only one event that night. To post four times that would all have been school records is amazing."